John Chrysostom (349– ca. 407 C.E.) was the archbishop of Constantinople known for his eloquence in preaching and public speaking, his denunciation of abuse of authority by both ecclesiastical and political leaders, and his ascetic sensibilities. After his death he was given the Greek surname chrysostomos, "golden mouthed," rendered in English as Chrysostom. The Orthodox Church and Eastern Catholic Churches honor him as a saint (feast day, November 13) and count him among the Three Holy Hierarchs (feast day, January 30), together with Saints Basil the Great and Gregory the Theologian. He is recognized by the Roman Catholic Church as a saint and a Doctor of the Church. Churches of the Western tradition, including the Roman Catholic Church, the Church of England, and the Lutheran church, commemorate him on September 13. His relics were looted from Constantinople by Crusaders in 1204 and brought to Rome, but were returned on 27 November 2004 by Pope John Paul II. Chrysostom is known within Christianity chiefly as a preacher and liturgist, particularly in the Eastern Orthodox Church. Outside the Christian tradition Chrysostom is noted for eight of his sermons which played a considerable part in the history of Christian antisemitism, and were extensively used by the Nazis in their ideological campaign against the Jews. He is sometimes referred to as John of Antioch, but that name more properly refers to the bishop of Antioch named John (429-441), who led a group of moderate Eastern bishops in the Nestorian controversy. He is also confused with Dio Chrysostom. 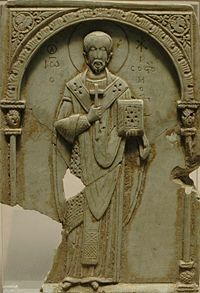 Byzantine Eleventh century soapstone relief of John Chrysostom, Louvre. John, later called "golden mouth" (Chrysostom), was born in Antioch in 349. Different scholars describe his mother as a pagan or as a Christian, and his father was a high ranking military officer. John's father died soon after his birth and he was raised by his mother. He was baptised in 368 or 373 and installed as a reader (one of the minor orders of the Church). As a result of his mother's influential connections in the city, John began his education under the pagan teacher Libanius. From Libanius John acquired the skills for a career in rhetoric, as well as a love of the Greek language and literature. As he grew older, however, he became more deeply committed to Christianity and went on to study theology under Diodore of Tarsus (one of the leaders of the later Antiochian school). According to the Christian historian Sozomen, Libanius was supposed to have said on his deathbed that John would have been his successor "if the Christians had not taken him from us". He lived as an ascetic and became a hermit circa 375; he spent the next two years continually standing, scarcely sleeping, and committing the Bible to memory. As a consequence of these practices, his stomach and kidneys were permanently damaged and poor health forced him to return to Antioch. Do you wish to honour the body of Christ? Do not ignore him when he is naked. Do not pay him homage in the temple clad in silk, only then to neglect him outside where he is cold and ill-clad. He who said: "This is my body" is the same who said: "You saw me hungry and you gave me no food," and "Whatever you did to the least of my brothers you did also to me"... What good is it if the Eucharistic table is overloaded with golden chalices when your brother is dying of hunger? Start by satisfying his hunger and then with what is left you may adorn the altar as well. His straightforward understanding of the Scriptures (in contrast to the Alexandrian tendency towards allegorical interpretation) meant that the themes of his talks were practical, explaining the Bible's application to everyday life. Such straightforward preaching helped Chrysostom to garner popular support. He founded a series of hospitals in Constantinople to care for the poor. One incident that happened during his service in Antioch illustrates the influence of his sermons. When Chrysostom arrived in Antioch, the bishop of the city had to intervene with Emperor Theodosius I on behalf of citizens who had gone on a rampage mutilating statues of the Emperor and his family. During the weeks of Lent in 397, John preached 21 sermons in which he entreated the people to see the error of their ways. These made a lasting impression on the general population of the city: many pagans converted to Christianity as a result of the sermons. As a result, Theodosius' vengeance was not as severe as it might have been. In 398 C.E., John was requested—against his will—to take the position of Patriarch of Constantinople. He deplored the fact that Imperial court protocol would now assign to him access to privileges greater than the highest state officials. During his time as bishop he adamantly refused to host lavish social gatherings, which made him popular with the common people, but unpopular with wealthy citizens and the clergy. His reforms of the clergy were also unpopular with these groups. He told visiting regional preachers to return to the churches they were meant to be serving—without any payout. His time in Constantinople was more tumultuous than his time in Antioch. Theophilus, the Patriarch of Alexandria, wanted to bring Constantinople under his sway and opposed John's appointment to Constantinople. Being an opponent of Origen's teachings, he accused John of being too partial to the teachings of that theologian. Theophilus had disciplined four Egyptian monks (known as "the tall brothers") over their support of Origen's teachings. They fled to and were welcomed by John. He made another enemy in Aelia Eudoxia, the wife of the eastern Emperor Arcadius, who assumed (perhaps with justification) that his denunciations of extravagance in feminine dress were aimed at herself. Depending on one's outlook, John was either tactless or fearless when denouncing offences in high places. An alliance was soon formed against him by Eudoxia, Theophilus and others of his enemies. They held a synod in 403 to charge John, in which his connection to Origen was used against him. It resulted in his deposition and banishment. He was called back by Arcadius almost immediately, as the people became "tumultuous" over his departure. There was also an earthquake the night of his arrest, which Eudoxia took for a sign of God's anger, prompting her to ask Arcadius for John's reinstatement. Peace was short-lived. A silver statue of Eudoxia was erected near his cathedral. John denounced the dedication ceremonies. He spoke against her in harsh terms: "Again Herodias raves; again she is troubled; she dances again; and again desires to receive John’s head in a charger," an allusion to the events surrounding the death of John the Baptist. Once again he was banished, this time to the Caucasus in Armenia. Pope Innocent I protested at this banishment, but to no avail. John wrote letters that still held great influence in Constantinople. As a result of this, he was further exiled to Pitiunt (Abkhazia region of Georgia) where his tomb is a shrine for pilgrims. He never reached this destination, as he died during the journey. His last words are said to have been, "Glory to God for all things!" Known as "the greatest preacher in the early church," John's sermons have been one of his greatest lasting legacies. Chrysostom's extant homiletical works are vast, including many hundreds of exegetical sermons on both the New Testament (especially the works of Saint Paul) and the Old Testament (particularly on Genesis). Among his extant exegetical works are sixty-seven homilies on Genesis, fifty-nine on the Psalms, ninety on the Gospel of Matthew, eighty-eight on the Gospel of John, and fifty-five on the Acts of the Apostles. The sermons were written down by the audience and subsequently circulated, revealing a style that tended to be direct and greatly personal, but was also formed by the rhetorical conventions of his time and place. In general, his homiletical theology displays many characteristics of the Antiochian school (i.e., somewhat more literal in interpreting Biblical events), but he also uses a good deal of the allegorical interpretation associated with the Alexandrian school. Outside of his sermons, a number of John's other treatises have had a lasting influence. One such work is John's early treatise Against Those Who Oppose the Monastic Life, written while he was a deacon (sometime before 386), which was directed to parents, pagan as well as Christian, whose sons were contemplating a monastic vocation. The book is a sharp attack on the values of Antiochene upper-class urban society written by someone who was a member of that class. Chrysostom also writes that, already in his day, it was customary for Antiochenes to send their sons to be educated by monks. Other important treatises written by John include On the Priesthood (one of his earlier works), Instructions to Catechumens, and On the Incomprehensibility of the Divine Nature. In addition, he wrote a series of well-known letters to the deaconess Olympias. During his first two years as a presbyter in Antioch (386-387), Chrysostom denounced Jews and Judaizing Christians in a series of eight sermons delivered to Christians in his congregation who were taking part in Jewish festivals and other Jewish observances. It is disputed whether the main target were specifically Judaizers or Jews in general. His homilies were expressed in the conventional manner, utilizing the uncompromising rhetorical form known as the psogos, whose literary conventions were to vilify opponents in an uncompromising manner. One of the purposes of these homilies was to prevent Christians from participating in Jewish customs, and thus prevent the erosion of Chrysostom's congregation. In his sermons, Chrysostom criticized those "Judaizing Christians," who were participating in Jewish festivals and taking part in other Jewish observances, such as the shabbat, submitted to circumcision and made pilgrimage to Jewish holy places. Chrysostom claimed that on the shabbats and Jewish festivals, the synagogues were full of Christians, especially women, who loved the solemnity of the Jewish liturgy, enjoyed listening to the Shofar on Rosh Hashanah, and applauded famous preachers in accordance with the contemporary custom. A recent theory is that he instead tried to persuade Jewish Christians, who for centuries had kept connections with Jews and Judaism, to choose between Judaism and Christianity. Chrysostom held Jews responsible for the crucifixion of Jesus and added that they continued to rejoice in Jesus's death. He compared the synagogue to a pagan temple, representing it as the source of all vices and heresies. He described it as a place worse than a brothel and a drinking shop; it was a den of scoundrels, the repair of wild beasts, a temple of demons, the refuge of brigands and debauchees, and the cavern of devils, a criminal assembly of the assassins of Christ. Palladius, Chrysostom's contemporary biographer, also recorded his claim that among the Jews the priesthood may be purchased and sold for money. Finally, he declared that he hated the synagogue and the Jews. In Greek, the sermons are called Kata Ioudaiōn (Κατά Ιουδαίων), which is translated as Adversus Judaeos in Latin and Against the Jews in English. The most recent scholarly translations, claiming that Chrysostom's primary targets were members of his own congregation who continued to observe the Jewish feasts and fasts, give the sermons the title Against Judaizing Christians. The original Benedictine editor of the homilies, Montfaucon, gives the following footnote to the title: "A discourse against the Jews; but it was delivered against those who were Judaizing and keeping the fasts with them [the Jews]." As such, some have claimed that the original title misrepresents the contents of the discourses, which show that Chrysostom's primary targets were members of his own congregation who continued to observe the Jewish feasts and fasts. Sir Henry Savile, in his 1612 edition of Homilies 27 of Volume 6 (which is Discourse I in Patrologia Graeca's Adversus Iudaeos), gives the title: "Chrysostom's Discourse Against Those Who Are Judaizing and Observing Their Fasts." Beyond his preaching, the other lasting legacy of John is is influence on Christian liturgy. Two of his writings are particularly notable. He harmonized the liturgical life of the Church by revising the prayers and rubrics of the Divine Liturgy, or celebration of the Holy Eucharist. To this day, Eastern Orthodox and most Eastern Catholic Churches typically celebrate the Divine Liturgy of St. John Chrysostom. These same churches also read his Catechetical Homily at every Easter, the greatest feast of the church year. 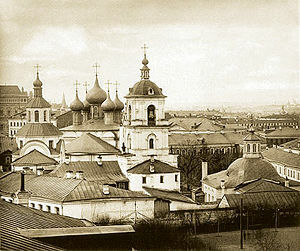 The Chrysostom Monastery in Moscow (1882). During a time when city clergy were subject to criticism for their high lifestyle, John was determined to reform his clergy in Constantinople. These efforts were met with resistance and limited success. He was an excellent preacher. As a theologian, he has been and continues to be very important in Eastern Christianity, and is generally considered the most prominent doctor of the Greek Church, but has been less important to Western Christianity. His writings have survived to the present day more so than any of the other Greek Fathers. He rejected the contemporary trend for allegory, instead speaking plainly and applying Bible passages and lessons to everyday life. His exiles demonstrated that secular powers dominated the Eastern Church at this period in history. It also demonstrated the rivalry between Constantinople and Alexandria for recognition as the preeminent Eastern See. Meanwhile in the west, Rome's primacy had been unquestioned from the fourth century onwards. An interesting point to note in the wider development of the Papacy is that Innocent's protests had not helped, demonstrating the lack of secular influence the Bishops of Rome held in the east at this time. Consider how [Jesus Christ] teaches us to be humble, by making us see that our virtue does not depend on our work alone but on grace from on high. He commands each of the faithful who prays to do so universally, for the whole world. For he did not say "thy will be done in me or in us," but "on earth," the whole earth, so that error may be banished from it, truth take root in it, all vice be destroyed on it, virtue flourish on it, and earth no longer differ from heaven. Christian clerics, such as R.S. Storr, refer to Chrysostom as "one of the most eloquent preachers who ever since apostolic times have brought to men the divine tidings of truth and love," and the nineteenth century John Henry Cardinal Newman described Chrysostom as a "bright, cheerful, gentle soul; a sensitive heart." Chrysostom's Adversus Judaeos homilies have been circulated by many groups to foster anti-Semitism. James Parkes called the writing on Jews "the most horrible and violent denunciations of Judaism to be found in the writings of a Christian theologian". His sermons gave momentum to the accusation of deicide—the idea that Jews are collectively responsible for the death of Jesus. British historian Paul Johnson claimed that Chrysostom's homilies "became the pattern for anti-Jewish tirades, making the fullest possible use (and misuse) of key passages in the gospels of St Matthew and John. Thus a specifically Christian anti-Semitism, presenting the Jews as murderers of Christ, was grafted on to the seething mass of pagan smears and rumours, and Jewish communities were now at risk in every Christian city." During World War II, the Nazi Party in Germany abused his work in an attempt to legitimize the Holocaust in the eyes of German and Austrian Christians. His works were frequently quoted and reprinted as a witness for the prosecution. After World War II, the Christian churches denounced Nazi use of Chrysostom's works, explaining his words with reference to the historical context. According to Laqueur, it was argued that in the fourth century, the general discourse was brutal and aggressive and that at the time when the Christian church was fighting for survival and recognition, mercy and forgiveness were not in demand. According to Patristics' scholars, opposition to any particular view during the late fourth century was conventionally expressed in a manner, utilizing the rhetorical form known as the psogos, whose literary conventions were to vilify opponents in an uncompromising manner; thus, it has been argued that to call Chrysostom an "anti-Semite" is to employ anachronistic terminology in a way incongruous with historical context and record. Chrysostom's liturgical legacy has inspired several musical compositions. Noteworthy among these are: Sergei Rachmaninoff's Liturgy of St John Chrysostom, Op. 31, composed in 1910, one of his two major unaccompanied choral works; Pyotr Tchaikovsky's Liturgy of St John Chrysostom, Op.41; and Arvo Part's Litany, which sets seven sentence prayers of Chrysostom's Divine Liturgy for chorus and orchestra. James Joyce's novel Ulysses includes a character named Mulligan who brings 'Chrysostomos' into another character's mind because Mulligan's gold-stopped teeth and his gift of the gab earn him the title which St. John Chrysostom's preaching earned him: 'golden-mouthed'. Widely used editions of Chrysostom's works are available in Greek, Latin, English, and French. The Greek edition, in eight volumes, was edited by Sir Henry Savile in 1613; the most complete Greek and Latin edition is edited by Bernard de Montfaucon in 13 volumes, (Paris, 1718-1738) republished in 1834-1840). There is an English translation in the first series of the Nicene and Post-Nicene Fathers (London and New York, 1889-1890). A selection of his writings has been published more recently in French in Sources Chrétiennes. 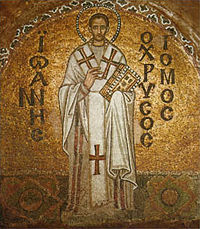 ↑ 1.0 1.1 1.2 "St John Chrysostom" in the Catholic Encyclopedia, available online; retrieved March 20, 2007. ↑ See the Letters of Pope John Paul II, available online; retrieved March 20, 2007. ↑ Yohanan [Hans] Lewy, "John Chrysostom" in Encyclopedia Judaica (CD-ROM Edition Version 1.0), Ed. Cecil Roth (Keter Publishing House: 1997. ISBN 9650706658). ↑ Jean Dumortier, "La valeur historique du dialogue de Palladius et la chronologie de saint Jean Chrysostome," in Mélanges de science religieuse 8: 51–56 (1951). Carter dates his birth to the year 349. See also Robert Louis Wilken. John Chrysostom and the Jews: Rhetoric and Reality in the Late Fourth Century. (Berkeley: University of California Press:1983), 5. ↑ "John Chrysostom," Encyclopedia Judaica (CD-ROM Edition Version 1.0), Ed. Cecil Roth (Keter Publishing House: 1997. ISBN 9650706658). ↑ The Encyclopedia Judaica describes Chrysostom's mother as a pagan. In Pauline Allen and Wendy Mayer, John Chrysostom, (Routledge, 2000), 5, she is described as a Christian. ↑ Wilken, 7 prefers 368 for the date of Chrysostom's baptism, the Encyclopedia Judaica prefers the later date of 373. ↑ John Chrysostom, In Evangelium S. Matthaei, hom. 50: 3-4: 58, 508-509. ↑ See Cajetan Baluffi, The Charity of the Church, trans. Denis Gargan (Dublin: M H Gill and Son, 1885), 39 and Alvin J. Schmidt. Under the Influence: How Christianity Transformed Civilization. (Grand Rapids, MI: Zondervan, 2001), 152; cited in Thomas Woods, How the Catholic Church Built Western Civilization. (Washington, DC: Regenery, 2005), 174. ↑ David H. Farmer. The Oxford Dictionary of the Saints, second ed. (New York:Oxford University Press, 1987), 232. ↑ Scholasticus, "Chapter XVIII: Of Eudoxia's Silver Statue", 150. ↑ "John Chrysostom" in The Oxford Dictionary of Church History, ed. Jerald C. Brauer (Philadelphia: Westminster Press, 1971). ↑ "John Chrysostom" in Encyclopedia of Early Christianity. ↑ "John Chrysostom" in the Catholic Encyclopedia, online, retrieved March 20, 2007. ↑ See Wilken, xv, and also "John Chrysostom" in Encyclopedia Judaica. ↑ "John Chrysostom" in Encyclopedia Judaica. ↑ Rodney Stark. The Rise of Christianity. How the Obscure, Marginal Jesus Movement Became the Dominant Religious Force in the Western World in a Few Centuries. (Princeton University Press, 1997), 66-67. ↑ William I. Brustein. Roots of Hate: Anti-Semitism in Europe before the Holocaust. (Cambridge University Press, 2003. ISBN 0521773083), 52. ↑ Harkins ; and also "Was Saint John Chrysostom Anti-Semitic?" . Chrysostom.org. Retrieved June 9, 2008. ↑ Chrysostom, Discourses Against Judaizing Christians, xxxi. ↑ James Parkes. Prelude to Dialogue. (London: 1969), 153; cited in Wilken xv. ↑ Paul Johnson, A History of the Jews. (New York: HarperPerennial, 1988), 165. Carter, Robert. 1962. "The Chronology of St. John Chrystostom's Early Life." Traditio 18:357–64. Dumortier, Jean. 1951. "La valeur historique du dialogue de Palladius et la chronologie de saint Jean Chrysostome." Mélanges de science religieuse, 8, 51–56. Farmer, David H. The Oxford Dictionary of the Saints, second ed. New York:Oxford University Press, 1987, 232. Hartney, Aideen. 2004. John Chrysostom and the Transformation of the City. London: Duckworth. ISBN 0520047575. Johnson, Paul. A History of the Jews. New York: HarperPerennial, 1988. Lewy, Yohanan [Hans]. 1997. "John Chrysostom." Encyclopedia Judaica (CD-ROM Edition Version 1.0). Ed. Cecil Roth. Keter Publishing House. ISBN 9650706658. Meeks, Wayne A., and Robert L. Wilken. 1978. Jews and Christians in Antioch in the First Four Centuries of the Common Era. (The Society of Biblical Literature, Number 13). Missoula: Scholars Press. ISBN 0891302298. Palladius, Bishop of Aspuna. Palladius on the Life And Times of St. John Chrysostom, transl. and edited by Robert T. Meyer. New York: Newman Press, 1985. ISBN 0809103583. Stow, Kenneth. 2006. Jewish Dogs, An Imagine and Its Interpreters: Continiuity in the Catholic-Jewish Encounter. Stanford: Stanford University Press. ISBN 0804752818. Andrew S. Damick. The Saint John Chrysostom Webpage. Retrieved May 12, 2007. The Divine Liturgy of St, John Chrystosom. melkite.org. Retrieved May 12, 2007. Symposium Commemorating the 1600th Anniversary of St. John's Repose Retrieved May 12, 2007. Newadvent Catholic Encyclopedia. newadvent. Retrieved May 12, 2007. Retrieved May 12, 2007.artid=497&letter=C&search=John%20Chrysostom Jewish Encyclopedia: CHRYSOSTOMUS, JOANNES Retrieved May 12, 2007. Writings of Chrysostom in the Christian Classics Ethereal Library edition of the Nicene and Post-Nicene Fathers: Retrieved May 12, 2007. Was St. John Chrysostom Anti-Semitic?. Orthodoxinfo.com. Retrieved May 12, 2007.